Del. Eleanor Holmes Norton hosted a D.C.-wide job fair Tuesday. 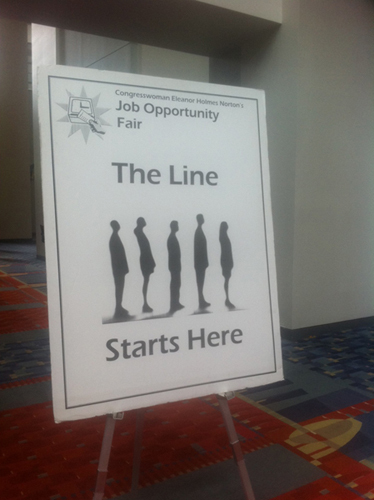 Job seekers formed a line that wrapped throughout the Convention Center for a D.C. job fair Tuesday. Job seekers came armed with resumes to Tuesday's District job fair. But employers directed people to apply online rather than in person. Job seekers found any available space to fill out job applications at Tuesday's job fair. 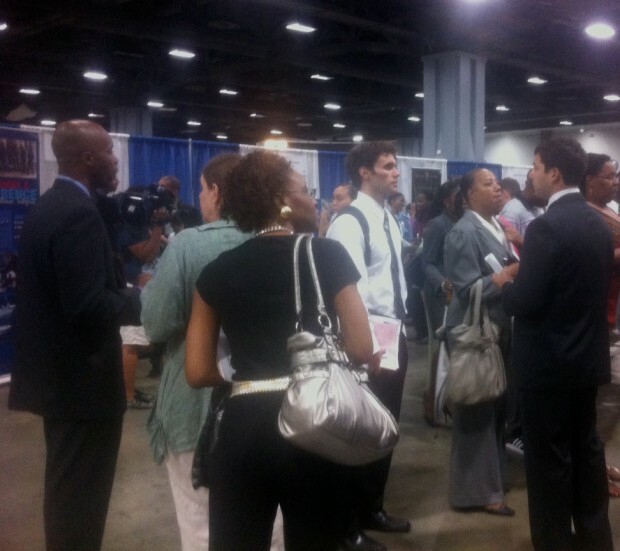 About 4,100 unemployed and underemployed District residents came to Tuesday's job fair. An annual D.C. employment fair drew one of its biggest crowds Tuesday as the District faces an unemployment rate that is higher than the national average. Last year, about 3,500 people attended Norton’s fair. This year, nearly 4,100 District residents came. 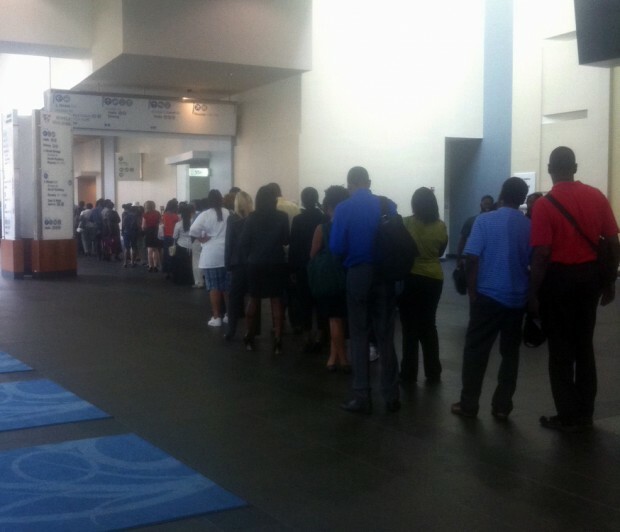 About 500 people waited for doors to open at 11 a.m. By noon, a large line of job seekers weaved throughout the Convention Center, from the entrance, down escalators and wrapped around long hallways. Unemployment in the District is uneven; jobless rates are higher than 20 percent in predominately black and low-income Ward 8, while it’s slight above 3 percent in affluent Ward 3 [PDF]. Government agencies seemed to draw the most job seekers — the Internal Revenue Service, Environmental Protection Agency, Department of Energy were flanked by people eagerly handing out resumes. Government jobs have long represented stable alternatives to the private sector, particularly for African Americans seeking ways around job discrimination. But there are fewer government jobs available, due to the recession and budget cuts. Most recruiters directed people to apply online, which can be a challenge for those District residents who don’t have Internet access. “But if you go to their websites, you see that they’re not really hiring,” Niyair Wilkinson, 23, said. At the Cardinal Bank booth, recruiter Charlene Davis said job interest has been high. But fewer than 20 position were listed on the flier she was handing out.